New year, new paper, new features! 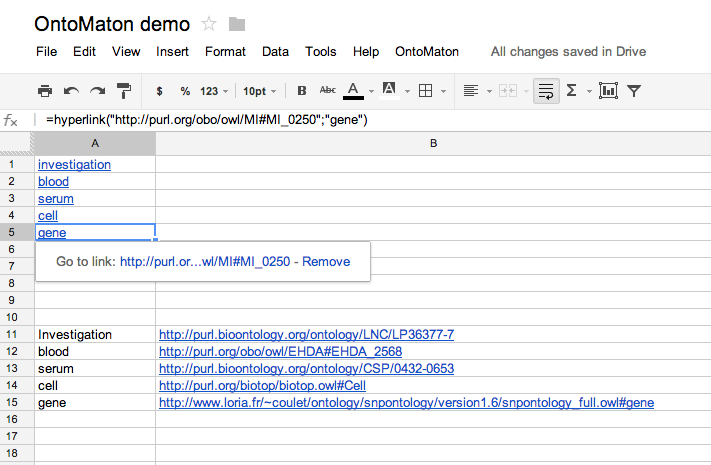 Our first post of the year is about a few announcements about OntoMaton, our tool for ontology searches and ontology tagging in Google Spreadsheets introduced back in July (see our previous blog post here and the initial video tutorial here). OntoMaton relies on NCBO web services to provide the tagging and searching functionalities based on ontologies, which are available through National Center for Biomedical Ontologies (NCBO) BioPortal. First, we would like to announce that our OntoMaton paper has been published in Bioinformatics! The paper is entitled “OntoMaton: a Bioportal powered ontology widget for Google Spreadsheets”, it is open access and a collaboration between the ISA team and Trish Whetzel on behalf of the NCBO, Stanford University, USA. The paper can be found following this link. Second, we would like to describe some extensions of the OntoMaton functionality that we produced since we first announced the tool. This new version is already available through the Google Apps Scripts Gallery. restrict the search space for columns, by selecting the ontologies sources for the terms in that column. These restrictions are added to a ‘Restrictions’ spreadsheet. While this functionality was already available in the initial version, the ‘Restrictions’ spreadsheet had to be created manually. In fact, currently the ‘Settings’ options allow you just to select ontologies to restrict the search space of particular columns, but by manually modifying the ‘Restrictions’ spreadsheet you can also restrict to specific versions and branches of the ontologies. both ontology tagging and searching functionalities, now provide a ‘Details’ option, which allows you to see the term ID and definitions of the terms you are considering (see screenshot below), so that you can make a more informed decision on the appropriateness of the term for your annotation. 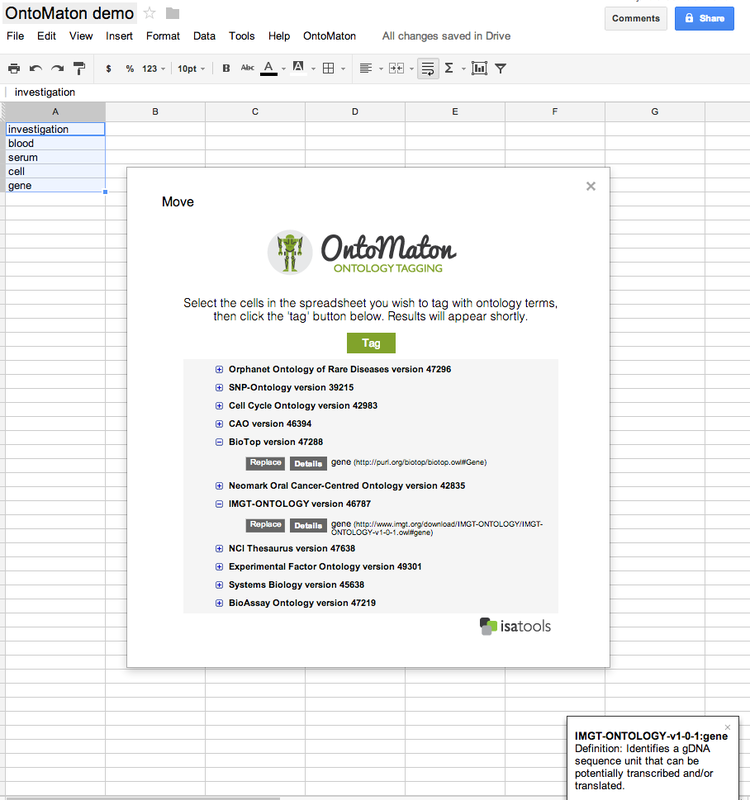 If you have already installed OntoMaton in a Google Spreadsheet, you will need to reinstall it to have the new functionality. If you are installing it for the first time in a Google Spreadsheet, you need to follow the same instructions as before (see our previous blog post here). The code updates are available in the GitHub repo, and if you have any feature requests or bug reports, please leave us a note in the Issue tracker. ← New paper on the Metabolights database!